After a serious accident, illness, or injury, a myriad of physical, cognitive, emotional, and spiritual difficulties can prevent an individual from getting back to their lives and to their work. Occupational therapy is a client-centered practice that focuses on the progress towards the client’s goals. Occupational therapy interventions focus on adapting the environment, modifying the task, teaching the skill, and educating the client/family in order to increase participation in and performance of daily activities, particularly those that are meaningful to the client. Occupational therapists may assume different roles such as advising on health risks in the workplace, safe driving for older adults, and programs to promote mental health for youth. Occupational therapists also perform functions as manager, researcher, program developer or educator in addition to the direct delivery of professional services. 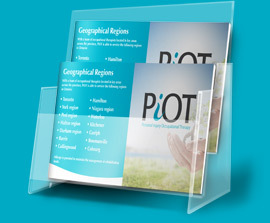 At PiOT we use a systematic approach based on evidence and professional reasoning to enable individuals, groups and communities to develop the means and opportunities to identify, engage in and improve their function in the occupations of life. The process involves comprehensive assessment, intervention and evaluation of the client related to occupational performance in self-care, work, study, volunteerism and leisure.